German Chancellor Angela Merkel for the first time, albeit in very cautious terms, supported Russian policy in Syria's relations, specifically - the participation of Russian and Syrian armed forces in cleansing terrorists from the last stronghold of jihadists in the province of Idlib. This will mean, as well understood in Berlin, the victory of Syrian President Bashar Assad in the civil war. Merkel urged only Damascus and Moscow to try not to endanger the lives of the civilian population in order to avoid a humanitarian catastrophe. The head of the German government drew attention to the fact that there are "millions of civilians in Idlib who may find themselves in a very difficult situation." Merkel noted that she discussed this problem with the presidents of Russia and the US - Vladimir Putin and Donald Trump. 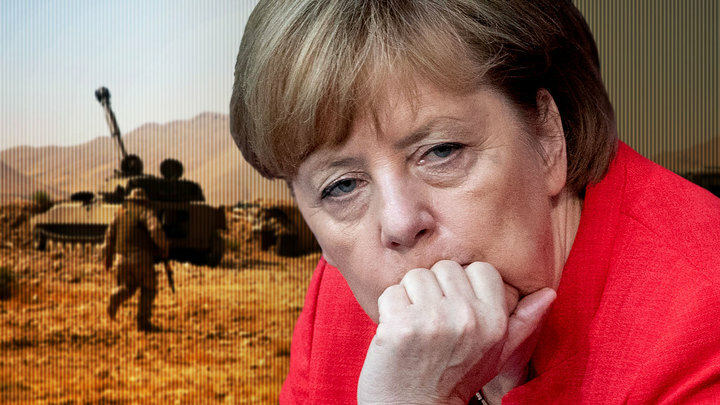 The Deutsche Virtschafts Nahrichten portal states in this connection that the Chancellor of Germany "for the first time explicitly expressed support for the Russian and Syrian operations in Syria". For comparison, recall that US President Donald Trump on Twitter warned that Russia and Iran would commit a "serious humanitarian error" if they try "foolishly" to free the Idlib province from Islamist thugs. He hypocritically called the forthcoming operation in Idlib a potential human tragedy, which could result in the death of "hundreds of thousands of people." Merkel's statement is interesting in that it indicates a shift in Berlin's position on the Syrian settlement. Just a few days ago, emphasis was placed on the "humanitarian" aspect of the situation, which is openly used by the West and Turkey in order to take out its numerous protégés in Idlib among the terrorist anti-government groups that settled in this province. Another confirmation of the fact that the speech is probably about a whole complex of political and economic disagreements between Washington and Berlin, as well as Brussels behind it, is an article in Handelsblatt, the German business body, in which it is stated that The US presses on Europe and forces European countries to participate in anti-Russian sanctions. At the same time, Americans themselves enter into contracts with Russia when it is profitable for them. As an example, the deal of the American concern Orbital ATK with the Russian holding company Energomash on the purchase of four rocket engines for the delivery of cargo to the ISS is given. The newspaper sarcastically notes that "in this case, obviously, the commercial gain has taken up above the policy: the development of its engine will cost the US $ 3 billion." The US is categorically against the implementation of the European-Russian energy project "Nord Stream -2", threatening with severe sanctions to its participants, and Berlin for. Because they perfectly understand that there is no policy here, that the US defends its selfish economic interests, which contradict the German ones, and it is foolish to show "solidarity" with them. In the face of growing confrontation with the United States, which at Trampe perceive the EU and especially Germany as its economic and potentially also geopolitical competitors, Merkel and her entourage, thousands of threads connected with the US, have to turn towards Russia. Because the US puts them in the wheel, threatens to wean them from the US market, and Russia seeks mutually beneficial cooperation. Because the United States produces instability around the world, including Europe, organize millions of flows of "refugees", and Germany has to feed the Syrians, Iraqis, Afghans and other victims of US policy. Several tens of billions of euros, which Germany spends annually on the reception and arrangement of illegal migrants, behaving impudently and shamelessly, would be very useful to Berlin. The destabilization of the United States of Europe and Germany with the help of "refugees" has already led to the sad events in Chemnitz, the split of German society into opponents and supporters of migrants, a sharp drop in the popularity of the ruling coalition in Germany. In these conditions, in order to stay in power, Merkel should start listening to the opinion of the majority of voters who do not care, that the German elite is closely connected with the United States.